Looking for a Used Trax in your area? CarGurus has 30,702 nationwide Trax listings starting at $6,995. Chevrolet brings its compact SUV, based on the Buick Encore and already tried and true in Mexico and Canada, to the States. Offering spacious accommodations for 4 (room for 5 if one is smaller), up to 48 cubic feet for cargo and all the right technology, the Trax is focused on practicality first and foremost. It might not be the speediest, or the prettiest, or even the plushest little SUV on the road, but it just might hit its mark as the most reasonable choice today. Squeezing 6 new models into the compact segment in the last 4 years—with tremendous sales growth as a result—Chevy adds the youth-oriented Trax to that list for 2015, looking to build on the surprising success of its larger Encore. Measuring 169 inches long with a 61-inch-wide stance technically putting it in the subcompact class, the Trax is essentially Chevrolet's taller replacement for the Vibe, which went out of production with the rest of Pontiac. A 138-hp, 1.4-liter turbocharged 4-cylinder engine powers the Trax, the same engine Chevrolet puts in its Sonic sedan. It makes 148 lb-ft of peak torque at just 1,850 rpm, reaching peak power just as the engine starts to get rough a hair under 5,000 rpm, and offers a 6-speed automatic transmission only. Fuel economy should be something like 26 mpg city/34 highway with the default front-wheel-drive (FWD) setup, but with a full 9.2 seconds to enjoy the view up to 60 mph, some drivers might be tempted to push it harder and net a worse real-world figure. All-wheel drive (AWD) will also be on the menu, but with worse economy of course. Given an engine out of the Sonic and most components borrowed from the Encore, the Trax is expected to feel confident—maybe even sturdy and poised—but thrilling might not be included in its character, and that tends to be a good thing in this segment. Compacts and subcompacts especially tend to be so nervous and twitchy they can be a chore to drive every day. When Chevrolet debuted the Spark with the same substantial feel of a midsize, they raised that bar, and the Trax is expected to follow in line with that same idea. Similarly, the Trax is designed to visually fit right in with the rest of the Chevrolet small-car lineup: tall hood, rounded nose, Chevrolet's latest distinctive grille and all. Otherwise it looks like a long-legged hatchback with a rugged side, showing off faux skid plates and rubberized accents outside. Inside, the Trax borrows yet more from the Sonic, including the digital speedometer and regular tach, not to mention an interior that looks a bit upmarket but feels true to the price. That said, 4 adults fit quite comfortably in that interior with plenty of door, seat and console cubbies to keep their things. There's seating for 5, but as is typical of the Trax's class, few people would ask to be squished into the narrow and elevated center seat. That second row folds flat, though, either entirely or any part of the 60/40 split, providing 18.7 cubic feet behind the seats or 48.4 cubes with them down. Safety features are quite bountiful and include 10 standard airbags, a rear-view camera, electronic stability control with rollover mitigation, electronic brakeforce distribution and Brake Assist. Complete feature lists are not known just yet, but LS, LT and LTZ trims will be offered, and upper trims will include On-Star and My Link connectivity, with an available 7-inch color touchscreen system, additional USB ports and Sirius XM satellite radio services. That system is compatible with Siri Eyes Free for iPhone, and with the Bring Go navigation app that allows you to beam directions from your smart phone to the car's navigation system. Chevrolet is even expected to offer the new On-Star 4G LTE wifi hotspot technology, too—jam-packing this little go-around with a lot to go around. 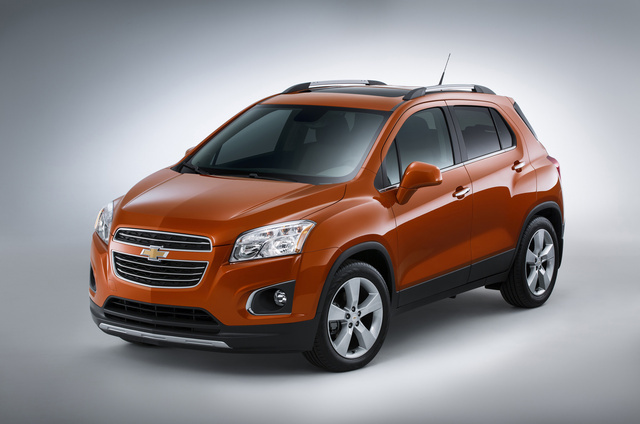 What's your take on the 2015 Chevrolet Trax? GuruYCNQ9 I love my 2015 Chevy Trax. It looks like a brand new car and it handles very well. It is good on gas and takes all the bumps of the Michigan roads well. I was so happy to find out that I could have a heated seat installed for the driver. Love it. Users ranked 2015 Chevrolet Trax against other cars which they drove/owned. Each ranking was based on 9 categories. Here is the summary of top rankings. 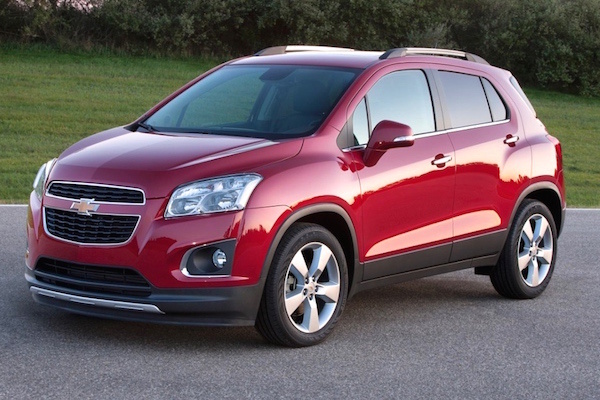 Have you driven a 2015 Chevrolet Trax?